I never heard of this product until I checked out the Amazon.com deal of the day last week and saw the offer of 20% off on all Bacon Salt products. I love bacon so I had to take a look. There were jars of Baconaisse (bacon-flavored mayo spread), bacon salt with various flavors like cheddar or jalapeno, and even bacon-flavored lip balm. Apparently everyone is abuzz about bacon. Next I took a look at the J&D website, the two partners who produce all this bacon ware. Bacon salt is actually a vegetarian product and is kosher to boot. So is the baconnaise. 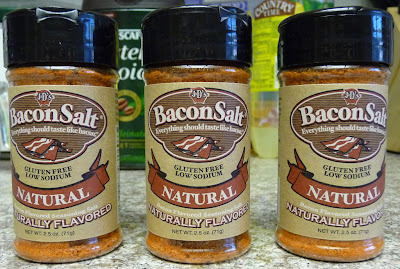 After studying the ingredients, I decided to order a three-pack of the "natural bacon salt" because it didn't have any MSG. All the other flavors, including the original, did. It was $10.69 for three jars, minus 20% off for being the deal of the day and I got charged $8.49. Not too bad considering the same thing costs about $4 per jar in the stores. The UPS guy dropped it off on the porch today. I tried a bit and yes, it does taste like bacon! Duh, bacon is full of salt so of course it should taste like bacon, right? It tastes like smoky bacon. The only thing is, while it is vegetarian and kosher and calorie-free and all that, nevertheless the main ingredient is salt so you need to be careful and watch your intake. Given that caveat, it does make a pretty decent bacon substitute and is a whole lot easier than putting up with fat splattering all over the place as you try and fry up a batch to satisfy that craving.